Preheat the oven to 180°C/160°C (fan)/ 350°F/gas mark 4. Lightly grease a 33 × 23cm baking tray and line with parchment paper. Put the flour, sugar and ground almonds into a bowl and stir to combine. Add the softened butter and, using an electric hand mixer, beat until well combined and the mixture has a crumb-like consistency. Press this mixture evenly into the base of the baking tray and bake on the middle rack of the oven for 10–15 minutes, or until golden brown on top and firm to the touch. Remove from the oven (leave the oven on) and allow to cool for 10–15 minutes before spreading with the raspberry jam and scattering the fresh raspberries over the top. Set aside while you prepare the frangipane filling. In a bowl, cream the butter and sugar together until light and fluffy, using an electric hand mixer. Add the egg and mix until just combined. Add the ground almonds and almond extract and beat again. 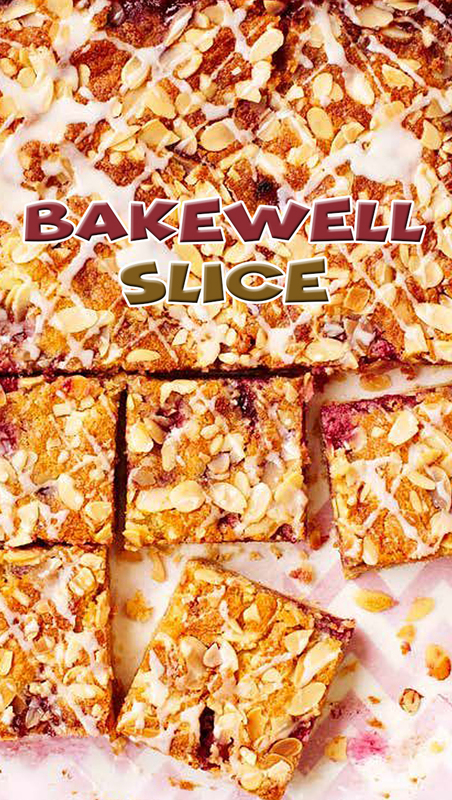 Carefully spread this mixture evenly over the raspberry base and sprinkle some flaked almonds over the top. Return the tray to the oven and bake for 35–40 minutes, or until an inserted skewer comes out clean. If the top starts to brown too quickly, cover with a piece of kitchen foil until the slice is cooked through. Leave to cool slightly while you prepare the glaze. Mix the icing sugar and water together in a bowl, using an electric hand mixer or a wooden spoon, until you have a smooth glaze with a coating consistency. Once the slice is almost cool, drizzle the glaze in diagonals across the whole slice. Allow it to set and then cut as desired to serve. Keep any uneaten slice in an airtight container at room temperature for 3–4 days.